Coconut Chocolate Chip Scones - What the Forks for Dinner? Every other Saturday Tim has to work. He has his own business Boyd’s Beer Line Cleaning Service. In the State of Illinois it is mandatory for any business serving draught beer to have their beer lines cleaned every two weeks……..that is what Tim does. His clients include your neighborhood bars and pubs, to large chains like Applebee’s and Buffalo Wild Wings. Sometimes on those Saturday’s, I make a little treat for when he gets home. 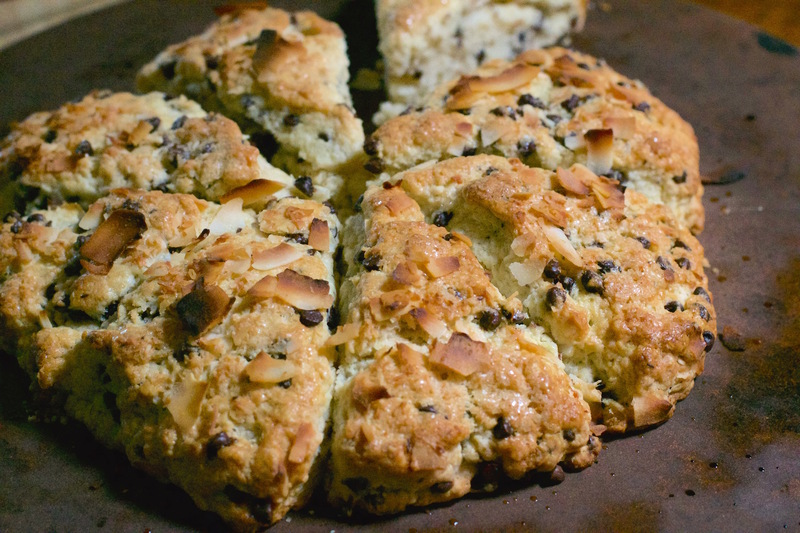 Coconut Chocolate Chips Scones this Saturday. Now, Tim, over our short married life has told me several things that he does not like…….mushrooms, sour cream, and coconut!! I have converted him on two……..he will never like sour cream…..such a shame! But, two outta three ain’t bad. 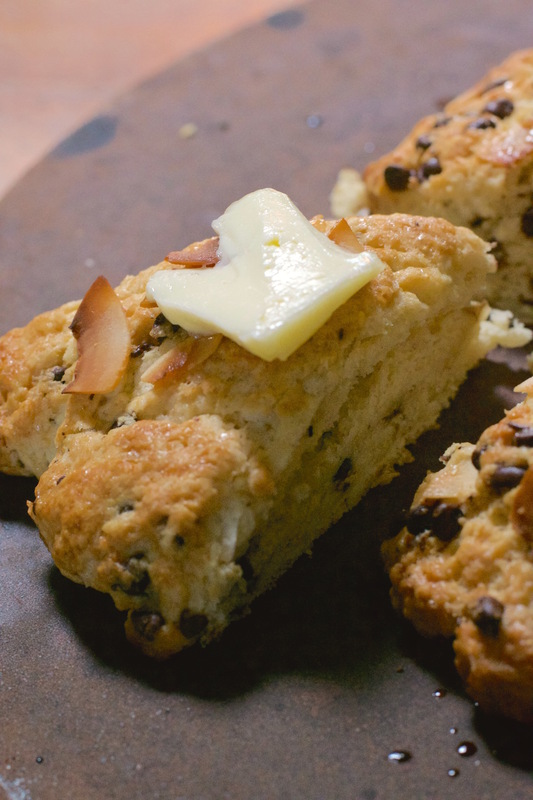 I went out on a limb with the coconut in the scones. I thought maybe the chocolate chips would cover the coconut……ok a girl can dream. I have been craving scones since my last visit to the Farmers Market. 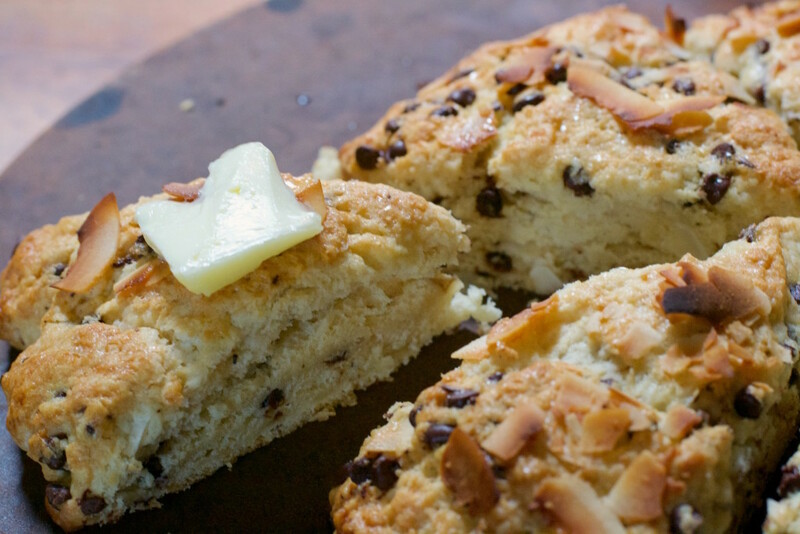 One of the local businesses Airplay Sports & Espresso has a booth at the Market and the sell the most fabulous scones……..Lemon Poppyseed…..my fav!!!!! So, anyway…….I had scones on the brain……..and no lemons…..and no poppyseed’s……..but, that did not mean no scones. 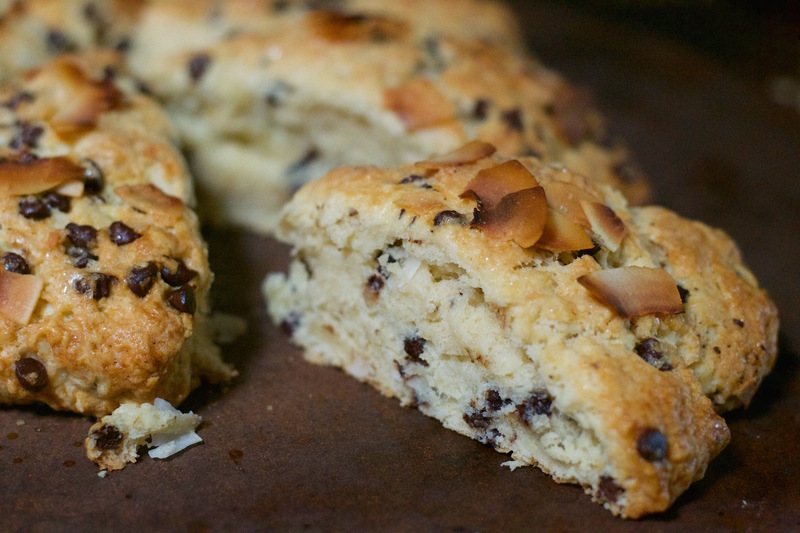 I did have chocolate chips….mini, and coconut. I buy organic, unsweetened, shaved coconut, and its already toasted. Since I was using organic coconut, maybe I should use coconut oil (solid) instead of butter. I have tired to substitute coconut oil for butter in several recipes with mixed results. In regular cooking, no problem. In baking……… disaster. I made some cookies that spread so far over the pan you couldn’t tell they were cookies. So, I was a little scared to try coconut oil again with in baked goods. Let me just say……SUCCESS!!! It worked!!!! These were pretty easy to whip together, and baked in about 20 minutes. I do suggest that you use a fork or pastry cutter instead of your hands to mix the coconut oil into the dry ingredients. The warmth of your hands will melt the coconut oil. I wish I would have had coconut milk, but alas I had none…….I apparently need a trip to the grocery store…….my eyes kinda glazed over at the thought…….I love the grocery store! I used almond milk instead, I’m sure any type of milk will work. 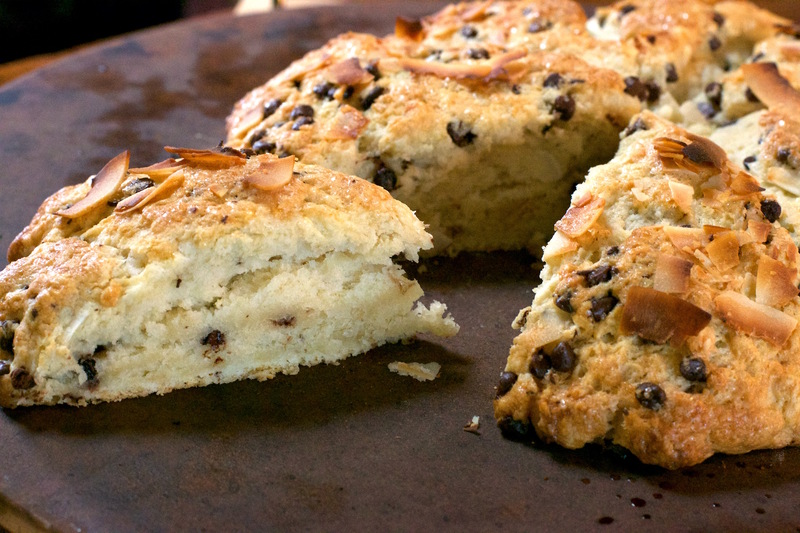 Tip…..don’t over mix the scones they will be tough. A through back to my days at the bakery…..I egg washed or glazed almost all of the baked goods. People eat with their eyes and an egg wash will give baked goods a nice little shine….along with a dusting of sugar. I love the crunchy turbinado sugar……..here’s the story………. Turbinado sugar is from pure cane sugar extract. The term turbinado comes from the technique used in the making of this sugar. The sugar is spun in a cylinder or turbine. Turbinado sugar is brown looking like brown sugar, but paler in color with a subtle molasses flavor…..so now you know! Anywho…….Tim came as I was trying to take pictures. My skill at this is still far, far behind that of my husband….but I try. 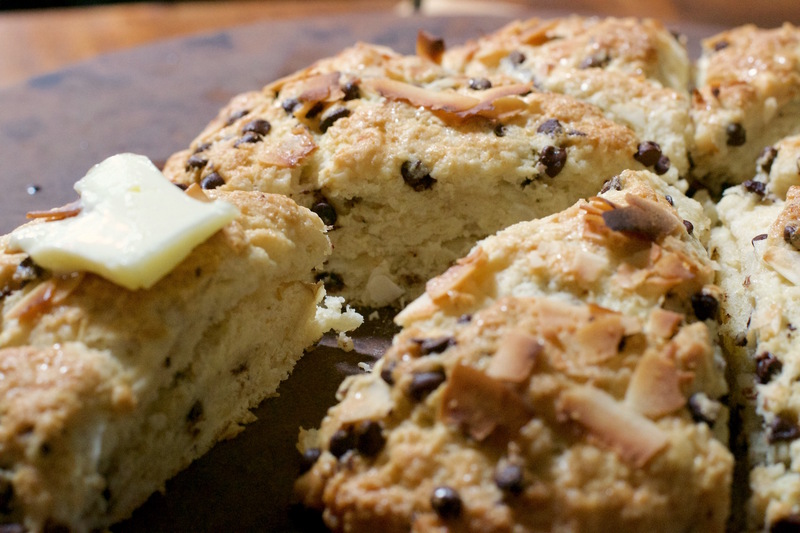 Enough said……..Coconut Chocolate Chips Scones…….tasty….in the words of a non-coconut lover! Place flour, baking powder and salt in a large bowl. Add coconut oil. Using a fork or pastry cutter cut coconut oil into dry mixture until crumbly in texture. Add almond milk, vanilla and sugar. Stir thoroughly. Place dough on lightly floured surface. Shape into a 7 or 8 inch circle. Cut into 8 equal portions. Place dough on a greased or parchment lined pan and shape into a circle. Flatten slightly. Cut into eighths separating slightly. Using a pastry brush and egg wash, brush each scones and dust with sugar.